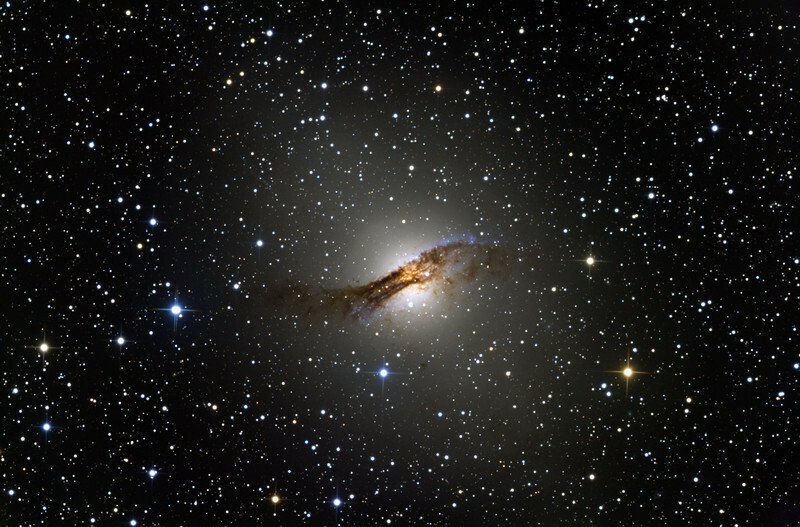 NGC 5128 or Hamburger galaxy. Observe the meat pattie major dust lane and blue OB stars triggered by the presumed collision between an edge-on spiral and an elliptical sesame seed bun. Explore the fine dust tracery and occasional lump of coal splashed about on the buns. This deep exposure shows the huge extent of the elliptical component. Just barely visible crossing the edge of the halo at about 10 o'clock is the relativistic polar jet from the central black hole. 18 hours total exposure using 20" CDK.